The NH-U12S is the latest 12cm model of Noctua's classic U-series single tower CPU coolers, which have received more than 400 awards and recommendations from the international press. The S-version's 45mm slim shape guarantees 100% compatibility with tall RAM modules and at the same time, its fine-tuned design and the class-leading NF-F12 FocusedFlow™ fan with PWM support for fully automatic speed control allow it to further improve its predecessor's renowned quiet cooling performance. Topped off with the trusted, pro-grade SecuFirm2™ multi-socket mounting system, Noctua's proven NT-H1 thermal compound and full 6 years manufacturer's warranty, the NH-U12S is a complete premium quality solution that combines outstanding performance, quiet operation and excellent compatibility. Other Thoughts: I have an i5-4690k. 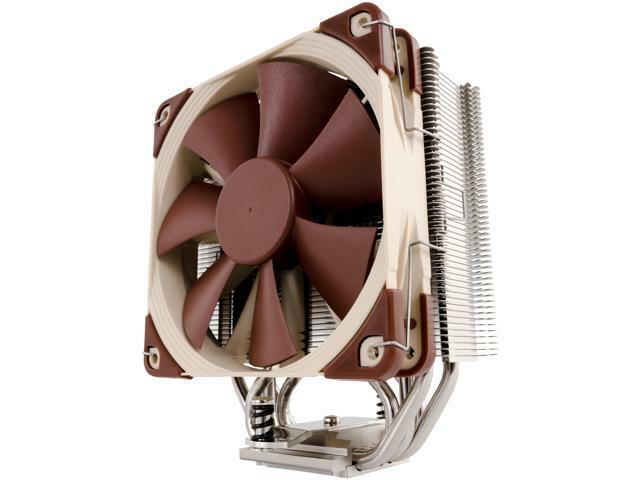 My previous cooler, the Arctic Freezer 7, did not cool anywhere near as efficiently as this Noctua cooler. Could have been because the fan was intaking air from directly above my gpu, but in any case this cooler is much more effective. Works well for my cramped motherboard, temps never reach above 56C under high load in a 60-70F room. And again, it's quiet. I wouldn't be able to tell my computer was on if it wasn't for case fans. Will consider replacing them for Noctua fans. Pros: Doesn't cover my ram or Graphics card. Keeps my i5 9600K Turbo boosted at 4.3 on all cores at 28C with no load and hasn't gone over 61C with an extended hard load. Dead silent! Easy as pie to install. Other Thoughts: Yes I would buy this! Best air cooler imo. Just make sure your case is wide enough for it. Pros: My old Corsair 300R has more fans than it probably needs already mounted in it, but I was using a spare stock Intel cooler (designed for an i5-6500) with an 8700K while looking at 3rd-party sinks and the extra fans helped. Recent general consensus on the hardware reviews on youtube was to go Noctua, so I gave it a shot and I've been pretty impressed. I'm now able to idle the CPU at near-ambient temps, and the highest I've seen reported in SpeedFan has been about 65°C under a short stress test. Install was pretty simple, my case has a nice big cutout that made it pretty easy. I thought about grabbing another F12 fan, but the included one seems to be doing an excellent job in concert with the rest of my case fans for now. In general the CPU fan is pretty quiet unless I put it under some pretty severe load; it doesn't really get louder than the myriad fans I'm already running. Cons: - Sharp heatsink fins! Be a little wary during installation. I managed an annoying finger cut. Probably my own fault, but still something to be aware of. - Heatsink is pretty huge. I'd had a side panel fan mounted and there wasn't room for the sink to fit at first, so I had to move some fans around. Depending on your case, some reconfiguration of your airflow might be in order. - Can get a little noisy under very heavy sustained load, but not awful. Other Thoughts: Very effective, easy-to-install air cooler. Just make sure you've got physical space for it in your case. Pros: Purchased and it arrived so fast I wasn't even able to build anticipation. The packaging was solid, simply foreshadowing the product within. So easy to install, haven't modified a computer in years, take the stock cooler off, clean the thermal paste, glance the install guide for a few seconds to familiarize with the bracket placement directions. Once the brackets are on, place the thermal paste, seat the heat sink onto the brackets, evenly tightening all four fasteners. Give the two tension screws (ones with springs) a firm push as you screw, otherwise they won't go into the threads and you will start to think something is wrong, all that is wrong is your lack of manly hand strength, CS:Go doesn't build that and neither does Xvideos. Don't forget to make sure your fan for the heat sink is in the proper direction blowing heat towards the exit fan, mine blows to the back of my computer allowing my exhaust fan to carry the heat out immediately. On GTA-V with the I7-8700 with a 2080 8g OC card totally maxxed, my CPU runs at a steady 20°c cooler than before, my card even runs cooler because the heat sink and fan actually sits so close to the card it pulls air over the top of the GPU, creating a more solid air flow direction than the stock cooler that literally pulls hot air onto the CPU from the heat being put out by the GPU. Idle Temps are semantical, they always run cool, and games like CS:Go don't even make the computer get warm. Temps for the CPU were running at a peak of 80°C under heavy load in GTA-V before, fluctuating of course, now it has trouble reaching 60°c. Other Thoughts: Would recommend, this is the perfect size, the brown color doesn't look as bad as you would think, with Rgb in mine it actually plays in well, and honestly I enjoy the cream color and brown. I have 4sticks of ram and it doesn't get in the way at all, quality product. Rendimiento similar a Liquid 120mm. Pros: mounting is real solid, and has room for my memory "corsair vengeance" on an old dz87klt-75k board. keeping stuff cool and quiet. Cons: a little too big, ...and ugly, needs some blue LEDs on it. Other Thoughts: ordered a 14mm and a 120mm the 140 is way too big, this 120mm is about right. im impressed i even got a badge. and the hardware is good quality.